From technical view, RM2.44 is a strong resistant. 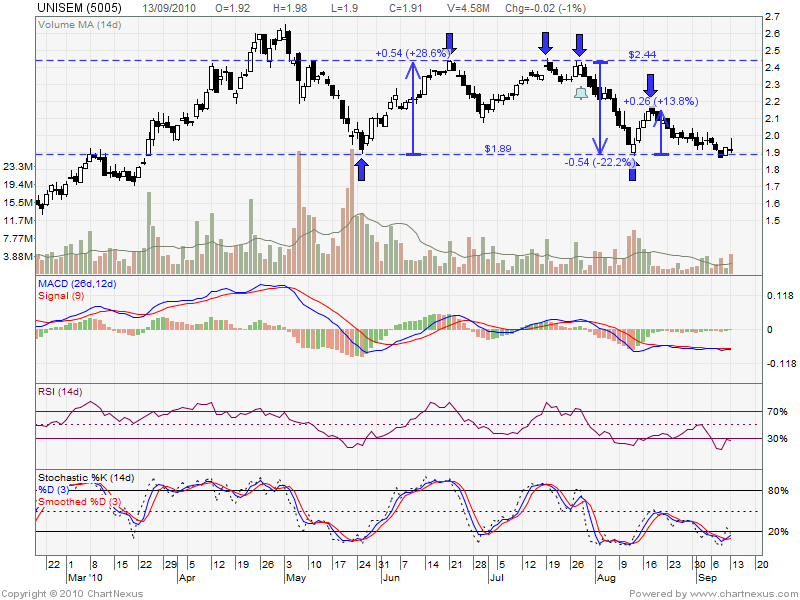 However, RM1.89 is a strong support level for UNISEM. On 10 May 2010, it start retrace down from RM2.44 high. On 25 May 2010, touching Rm1.89 & rebound back to RM2.44 high (+28.6%). After 3X attempt RM2.44, still unable break through, it retrace down to RM1.89 again (-22.1%) & small rebound to RM2.15 level (+13.8%). Currently, it was trade around RM1.90 level, which is the strong support level. Will it future retrace down OR rebound up??? 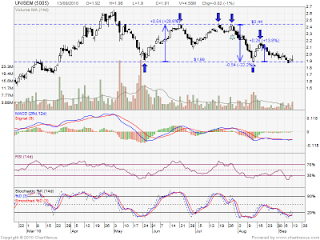 If it was break down RM1.89 support level, this stock will be downtrend stock cause it is forming lower high lower low. Definitely, high selling pressure will push the price lower. Let watch closely to protect capital. On the other hand, look for opportunity to entry.